In perfect balance between reality and fiction, P. Gherardini, in his article “Vini da leggenda” (Legendary Wines) appeared on Il Corriere Vinicolo n.43 on October 27, 1958, referred to an ancient tale explaining the origins of Albanello. He wrote, “Albanello of Comiso was born at dawn to cheer up the departure of a crusader, since his family was poor and could not make a toast because they had no wine”. 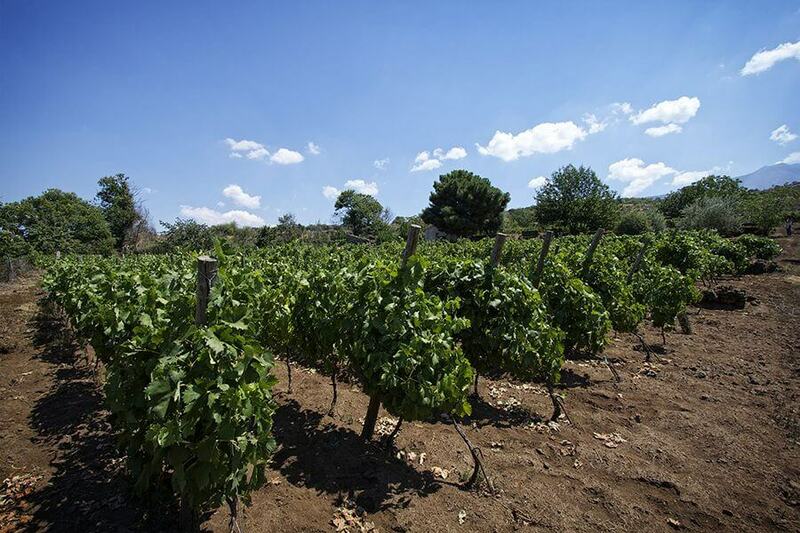 He is famous as the “legendary disappeared vine variety” but, in reality, Albanello, even if almost extinct, is still present in some areas near Syracuse and Catania, as Contrada Nave, a wonderful land between Bronte and Maletto in the province of Catania. Here the lush and volcanic soil has allowed some clones of Albanello to grow, giving rise to a new series of planting “experiments”. We have reserved a small lot of about 500 vines of Albanello in our vineyard, planted after a very long massal selection of old local vine varieties. 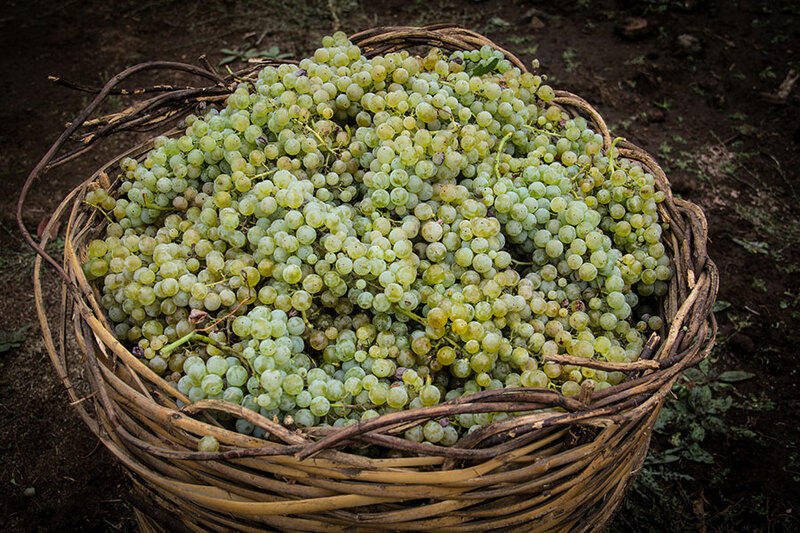 The alluring aura of mystery that surrounds this white vine variety, morphologically close to Grecanico Bianco and related to the Sardinian white wine Albaranzeuli and the Elbling of the Mosel region, along with its extreme resistance to parasites, has brought some intrepid and purist winemakers to start its gradual recovery process. The first producer of Albanello we know of was the noble Landolina family, who started the harvest and vinification process of this vine variety in 1712, along with the Grillo family. Albarello is truly an important vine variety, whose qualities have attracted many writers’ interest since the eighth century, when he was widespread only in the lands between Syracuse and Ragusa. Even then, however, it was quite rare and particularly expensive, mainly employed in the production of liqueur wines. Giuseppe of Rovasenda described it as follows: “Albanello of Syracuse, one of the best liqueur wines I have ever tasted, was made with these grapes”. In 1879 the famous enologist Giovanni Briosi wrote about this vine variety: “Albanello is not very famous on the wine market, especially abroad, but with it we could make the best dry wine of the entire Sicily”. It was only at the beginning of the last century that the great archeologist Paolo Orsi (to whom the Archeological Museum of Syracuse has been dedicated), during an excavation at the necropolis of Cozzo Pantano, brought to light some artifacts, including a drinking vase of 1500 A.C. According to Orsi this vase proved the cultivation of white vine varieties of Albanello in the Sicilian areas that were part of Magna Grecia. Albanello is therefore a historical vine variety of the Syracuse area, as well as a vine variety of high quality. Also the famous Viala and Vermorel praised both the dry and the raisin wines produced with Albanello’s grapes (1909). In 1960 the greatest critic of Italian wines, Luigi Veronelli, wrote that the wines derived from Albanello had an excellent alcoholic strength (up to 19%), but were very expensive. After a catastrophic spread of phylloxera, however, almost every European vineyard was destroyed and winemakers started panicking. Until… despite the initial bewilderment, between the end of the XIX century and the beginning of the last one, people decided to start planting it again in the southeastern area of Sicily. In 1970, however, the cultivation and vinification process started also in the provinces of Caltanissetta and Catania. Thanks to the cloning of local vine varieties, the wine produced in these areas presents an unusual aromatic hint with a strong scent that blends into a truly inviting almondy finish. It is the volcanic soil that makes the difference and bestows unparalleled charm and richness on this vine variety. Albanello is especially appreciated both in its acid version, harvested before its complete ripening, and in its sweeter version, dried on the plants or rack-dried for at least eight days. Many illustrious people have written or spoken about the wines produced with this great and mysterious vine variety that, even if still unknown to most, once tasted can charm anyone. We cannot help mentioning the great journalist Giuseppe Coria, author of “Grandi Vini di Sicilia” (Great Sicilian Wines) and “Profumi di Sicilia” (Sicilian scents), and the famous film director Mario Soldati, both great connoisseur of local vine varieties and of the Sicilian gastronomic and wine tradition. Coria, tasting an Albanello of 1946, described it accurately: “The Albanello wine is produced with the grapes of the homonymous vine variety, whose plants ripe long in the sun; even their leaves are cut in order to let every ray of sun shine through. The vinification is peculiar: the first fermentation is blocked and slowly restarted later. The wine shows a dark amber color, with golden transparencies. Its scent is typical of a very aged ethereal wine, with a full and majestic bouquet. Its taste is slightly sweet, with non-sweet traces: warm, velvety, generous, and more than harmonious. Natural alcohol content of 19% ”. …and he affirmed it was one of the most long-living white wines, with an ageing capacity of up to 100 years! It is truly amazing, to say the least. Mario Soldati described it, on the other hand, as a true “ace”, one of the most appreciated Sicilian vine varieties. Some decades ago, a DOC was proposed for the Albanello wines, but it was refused probably because of its limited productivity. Nonetheless, Albanello is included among IGT wines. Albanello’s morphological qualities allow us to describe it as a plant of medium vigour with medium-large leaves. Its bunches are medium-sized, short, conical or cylindrical, with one or two short wings, moderately compact, slightly straggly. Berries are moderately spheroidal or ovoid, with a moderately pruinose, thick and compact skin. They present a light yellow color tending to green, golden when exposed to the sun, and a typical sweet taste. The production of the plant is regular and the grapes reach maturity around mid-September. 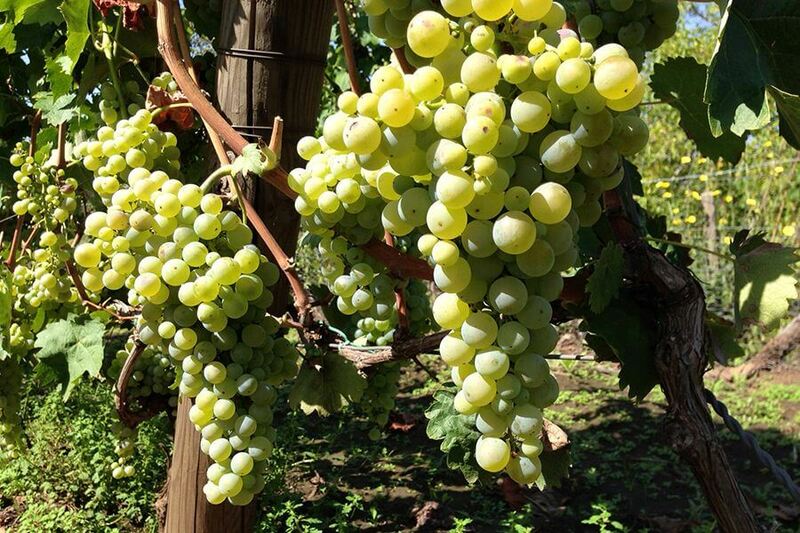 Albanello is typically vinified with other grapes: the produced wine is particularly refined, with its strong straw-yellow color, a rich aromatic content and a rich taste structure. Even if it is not an aromatic vine variety, Albanello can develop very complex floral and austere notes over the years. It can be used to produce an intriguing and different wine, that does not only improve with time, but gives to those lucky enough to taste it a gentle but intense bouquet of scents and flavors very hard to forget. 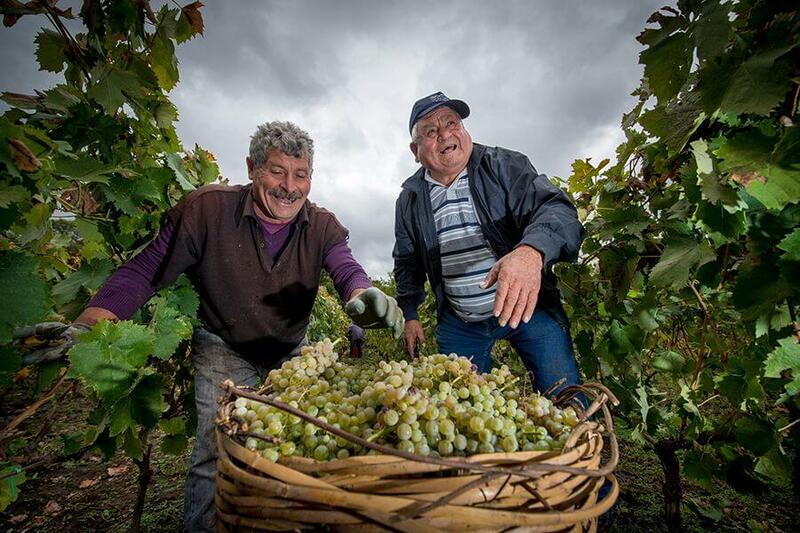 Even if Albanello’s history is lost in the midst of time, if we exclude some small local productions, some enthusiastic winemakers are making great efforts to restore it to its former glory and to let the entire world know about this white vine variety, proposing it to consumers more and more demanding and careful about the quality of what they drink.